Shrimp and fresh vegetable, topped with peanuts, make this healthy bowl a family favorite. Dovetailing Tip: Leftovers are good to pack in lunches. This heats up and serves well. Heat vegetable oil a small skillet over medium heat. Add shallots; cook and stir and softened and lightly caramelized, about 8 minutes. Preheat an outdoor grill for medium heat and lightly oil the grate. Skewer 4 shrimp on each skewer and grill until they turn pink and are charred on the outside, 1 to 2 minutes per side. Set aside. Bring a large pot of water to a boil. Add vermicelli noodles and cook until softened, 12 minutes. Drain noodles and rinse with cold water, stirring to separate the noodles. 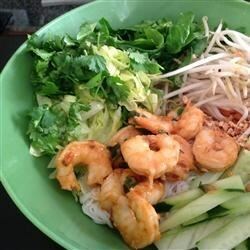 Assemble the vermicelli bowl by placing the cooked noodles in one half of each serving bowl and the lettuce and bean sprouts in the other half. Top each bowl with cucumbers, carrots, daikon, cilantro, Thai basil, peanuts, and the caramelized shallots. Serve with shrimp skewers on top and sauce on the side. Pour sauce over the top and toss thoroughly to coat before eating.